This documentation is for PKanalix, an application of MonolixSuite2019R1. the compartmental analysis (CA) consisting in finding parameters of a model representing the PK as the dynamics in compartments for each individual. Notice that this compartment analysis does not include population analysis that could be performed in Monolix. PKanalix provides a clear user-interface with a simple workflow to perform NCA and CA analysis in an efficient way. The first main feature of PKanalix is the calculation of the parameters in the Non Compartmental Analysis framework. This task consists in defining rules for the calculation of the \(\lambda_z\) (slope of the terminal elimination phase) to be able to compute all the NCA parameters. This definition can be done either globally via rules or on each individual where the user can choose or remove any point in the \(\lambda_z\) calculation. 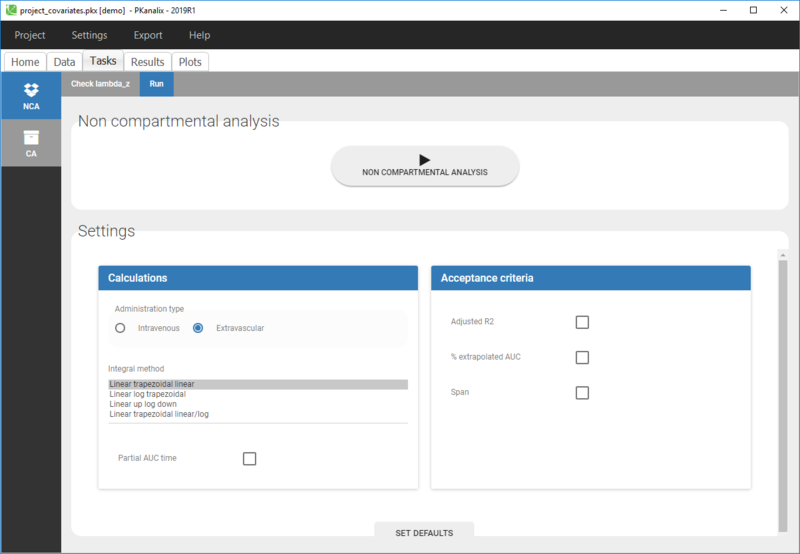 The second main feature of PKanalix is the calculation of the parameters in the Compartmental Analysis framework. It consists in finding parameters of a model representing the PK as the dynamics in compartments for each individual. This task consists in defining a structural model (based on a proposed PK models library) and estimate the parameters for all the individuals. Automatic initialization is performed for a better convergence of each parameter for each individual. All the NCA and/or CA outputs are displayed in sortable tables and exported in the result folder in a R-compatible format. Additional interactive plots are proposed for a better interpretation of the results. The usage of PKanalix is not only done via the user interface, we also propose a dedicated R-package (detailed here) to run PKanalix via R. All the actions you see in the interface have their equivalent R-function. It is particularly convenient for reproducibility purpose or batch jobs. Finally, notice that performing a population analysis is straightforward as you can import your project into Monolix. Indeed, all our applications share the same data management and thus the analyses in PKanalix can provide a basis for a population analysis in Monolix.